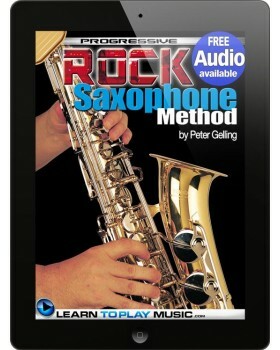 Teach yourself how to play saxophone with our easy rock saxophone lessons for beginners. 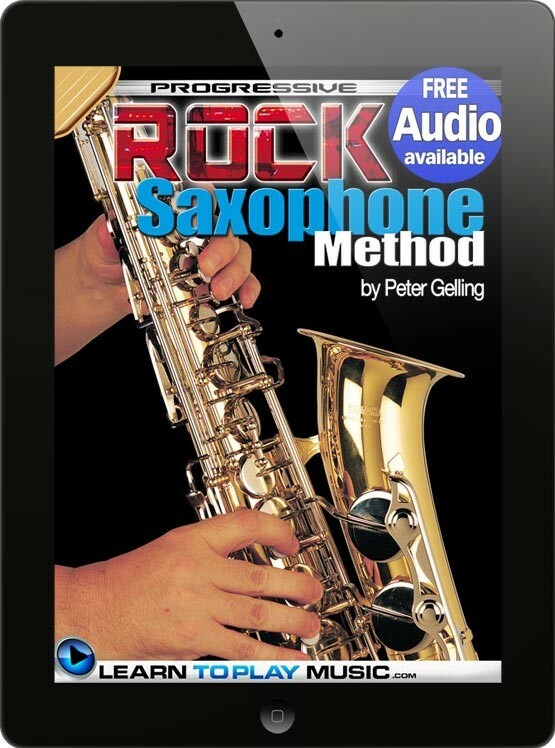 Progressive Rock Saxophone Method contains all you need to know to start learning to be a great rock saxophone player - in one easy-to-follow, lesson-by-lesson rock saxophone tutorial. Suitable for all ages and all types of saxophones including alto saxophone, tenor saxophone, soprano saxophone, and baritone saxophone. Basic knowledge of how to read music and playing the saxophone is required to teach yourself to learn to play saxophone from this book. Contains everything you need to know to learn to play the saxophone today. Beginner saxophone lessons have never been this easy for anyone who wants to learn how to play the saxophone, fast. LearnToPlayMusic.com's rock saxophone lessons for beginners are used by students and saxophone teachers worldwide to learn how to play saxophone. For over 30 years, our team of professional authors, composers and musicians have crafted saxophone lesson books that are a cut above the rest. We offer a huge selection of music instruction books that cover many different instruments and styles in print, eBook and app formats. Awarded the 'Quality Excellence Design' (QED) seal of approval for eBook innovation, LearnToPlayMusic.com continues to set the standard for quality music education resources. - If you don't have a decent ability to read music this course maybe a bit of a challenge. However if you want to learn how to read sheet music then this could be a good tool to do so. From my limited time with the sax I think you will struggle to learn the instrument without knowing how to read music. - The iBook format is a bit awkward. You have to have iBooks open and be on the learntoplaymusic website to use the tracks so you have to switch back and forth while managing you horn. Granted I'm old school paper and CD guy but it would be nice to be able to print out the sheet music and download the audio files so you could manage the through a looper like Garageband or some other device. Being able to isolate a part of the track would be helpful.